. :: The Perils Of Show Jumping Sport - 27 ::. Since I last had a chance to blog when Zorro had just won the Grand Prix in Calgary things have, as usual, galloped along at a crazy pace. It was just after this that we received the exciting news that Sam had received an invitation to the prestigious Dublin Horse show, Ireland's only five star show, and only two hours from home, one which he had been pushing hard to try to get into. However, of course, as always with the WKD team things were never quite as simple as you would hope.... 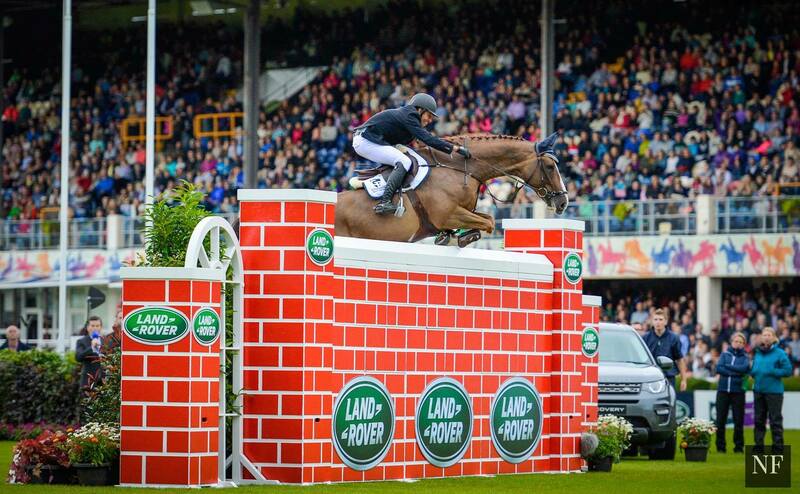 There was a slight condition to Sam’s invitation; he was expected to bring a PUISSANCE horse! Yes we have many ages, sizes, varieties and breeds at sycamore horse farm, in fact we pride ourselves in our diversity, but we most certainly did not have anything which could remotely tackle a great big red wall, in front of thousands of spectators, in the world’s richest puissance event. Sam momentarily looked whiter than me, which believe me is not easy, I, however took a more pragmatic approach and took to social media!!! I was just wading through all the various options, wondering how with only a short space between us returning from Calgary to the start of Dublin show, we would fit in time to try out, and select our potential puissance candidate, (and indeed also wondering how one goes about trying a puissance horse out...) when out of the blue our next door neighbour at home texted me to say that he had seen my post and they had a puissance horse who ,only the previous winter, had won an indoor event were it jumped 2m05. This to me had to be fate, and best of all it was right beside our farm so the trial process suddenly got a lot simpler. The week before the show Sam met his steed for the wall; a great big handsome chestnut gelding called Seapatrick Cruise, or "Socks" to his owners, the Megahey family, due to his four great big white legs. We took him to a local indoor school which had a wall and the pair got to size each other up and have a practice, all seemed to go well and Sam started to return to his normal colour again! In no time at all it seemed we were heading to the show, I had elected to drive the horses there as it’s only two hours down the road, however I started to somewhat regret my enthusiasm for driving the truck as the sat nav kept trying to take me up streets unsuitable for lorries and I realised we were heading further and further from where we wanted to be. We eventually managed to flag down a local taxi and after a probably very illegal three point turn in the middle of one of the major roads through Dublin, we finally were heading into the hallowed gates of Simmonscourt, home of the Irish horse for over ninety years, and in whose main arena all the great legends in our sport have at some time or another participated. After what felt like several hours pirouetting my forty foot truck around various obstacles, people, horses and small children, and much to the amusement of various onlookers, the WKD truck finally found its resting spot and our home for the week. Horses got unloaded, beds made, and the trot up done. We were ready for the week ahead. Sam had three horses to compete, Suma s Zorro, limelight de breve, wkd diva, oh, and of course, not to forget socks, the puissance horse. The first day was a baptism of fire for us all, the weather was cold, wet and windy, and with there being a long walk from the main practice to the arena by that night we were all extremely exhausted! The horses had performed alright, but after such a winning streak in Spruce and a long journey home they were, to be honest, a bit lacking in their usual spark. Zorro had jumped a super clear in the first round of the big class, as usual giving her all, but in the second round she looked tired and had two fences which she would never normally have had. Diva jumped a super round but was just unlucky to touch a fence, and limelight de breve just showed her lack of fitness, as she had been on her holidays whilst we had been in spruce, and only came back to work when we heard Sam had been selected! 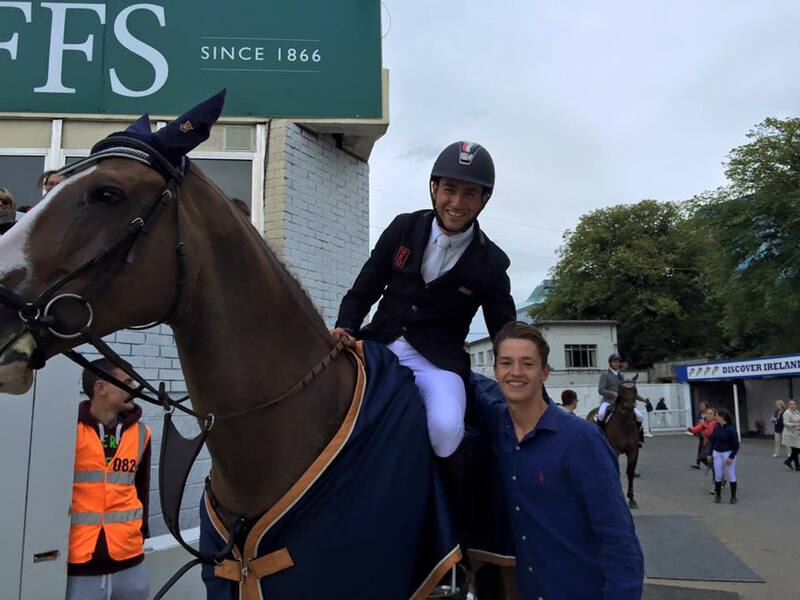 The next day started a bit better as limelight and Sam blazed around the speed Derby, in an entertaining class with banks, ditches and even a lake to splash through, to finish in a respectable seventh place. Sam was out of the starting blocks and it looked like things were picking up in his favour. However it became clear to us after morning work that Zorro was really not herself, and after a below par performance in her class, resulting in her overreaching badly, we decided to take a blood test as she looked really down and not her usual self. Under advisement from our fantastic vet Marcus Swail, we took the hard decision not to jump her again that week as her bloods were indeed very wrong pointing to some sort of infection or allergy being present, and the WKD team was very depressed that evening as we faced the thought that after all our hard work to get there, with Sam’s best chance in the Grand Prix side-lined, it looked like his first appearance at the show might be more of a damp squib than the burst of fireworks we had hoped for. God definitely works in mysterious ways!!! All day poor Sam had to listen to various people asking him if he was nervous, stressed or even sane ( I must confess the last question came from yours truly ) and definitely in the warm up there was a palpable air of tension. I had drafted in my best friend Liam to help me with the warm up, as I had no clue how to even suggest warming up for running down to a starting wall of 1m80, and with Sam third to go, sixteen starters in total, we privately thought well at least we might get finished up quick enough to head up to meet everyone else and enjoy the craic!! He jumped the compulsory four fences effortlessly, then he headed for the, what seemed to me already impossibly huge, big, red wall..... Looking at it from the bottom of the arena it seemed like forever, he turned the corner, blocked from view by the wall, until suddenly I saw a pair of ears, neck, Sam and the rest of the horse, as they sailed over this huge red wall. The crowd cheered, Sam punched the air, and I wailed as I realised he would have to go again.... I was not sure if I could take four more rounds never mind Socks and Sam!! Nearly everyone got through this round and very soon it was time to go again. Sam the second time, that he had done it once, seemed much more relaxed and once again cleared it with ease. Then the entertaining part started as him and the Venezuelan rider realised that there was an audience who is looking for a show - and my goodness it was a show the two of them put on!! Whilst standing at the pocket waiting for Sam to come out after his third round over an ever increasing wall, I realised that it was an awfully long time since he had actually jumped it - what was he doing?!! I stuck my head over the parapet to see Sam in the middle of what can only be described as a victory gallop, waving manically at the crowd and encouraging them to cheer him even louder and louder - at one stage I’m pretty sure he even started a Mexican wave..! Then we suddenly realised it was the second last round, the wall was a humongous 2m10 and there were only five or six horses left in the running - and Sam, who had never jumped a puissance before, was on one of them!! The last round beckoned, the wall was now 2m20, only Sam and the Venezuelan, Andreas Rodrigues were left to fight it out... The crowd by this staged were whipped up into a frenzy of chanting and Mexican waves by the commentator, as Sam walked into the arena it was like a rock star going on stage - I have never felt such an atmosphere at a horse show, Sam and Socks were loving it!! They popped the triple bar, turned the corner, and again the seemingly endless wait until finally the ears appeared, then the rest of horse and rider climbing impossibly high in the air, the tail appeared - and yes, they have done it... They cleared the last round and worst case they were a tie for first place. Sam of course did his now customary several laps of the arena and I was actually only just amazed he did not resort to leaping of the horse and crowd surfing around the RDS at this point! I could not watch as the last horse went in, but a sudden groan from the crowd signalled that he had only gone and done it - Sam had jumped in his first ever puissance and actually won!! What an amazing achievement and what a feeling for everyone involved. You have no idea what it means to win this class in Ireland, the publicity surrounding it was incredible and Sam swiftly became the most famous Egyptian for the rest of the show in Ireland, it was like walking around with a film star as everyone wanted to congratulate him, shake his hand or take his photo; thank goodness Sam is pretty grounded ( living with my constant sarcasm I like to think helps) or else we would have for sure had to buy him a new hat to fit his head in! 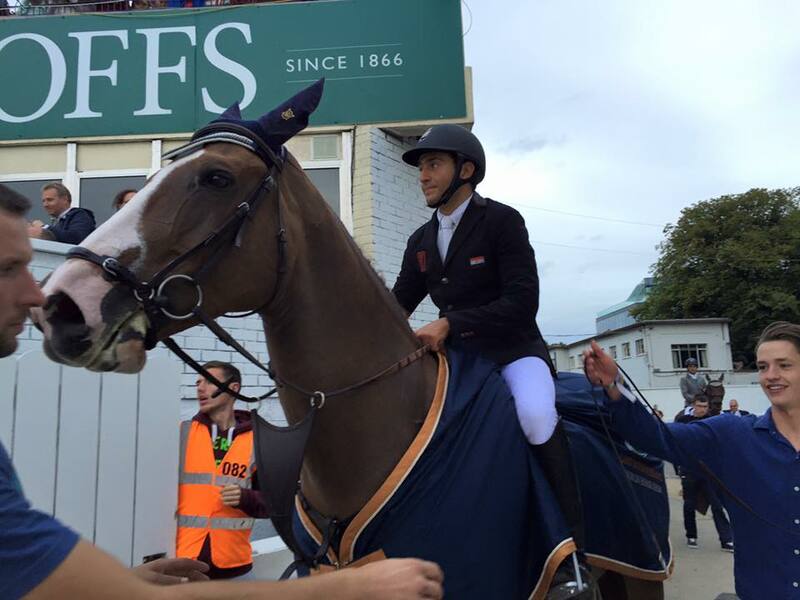 It was such a lift for the whole team and amazing for Socks owners who were all there to see him, Sam proved how once again he is an incredibly talented rider, who manages to give every horse he rides such confidence that they would even run down to a brick wall that they can't even see over. So Dublin show was the success we had hoped for, but not from the horse or the class that we had planned - but then as the saying goes God laughs as man makes plans, and who knows what's ahead for the WKD team next as we head away again next week for more adventures on the road with our showjumping team.